As of 7:33pm, the Severe Thunderstorm Watch for El Paso County, including #UCCS, has been cancelled. 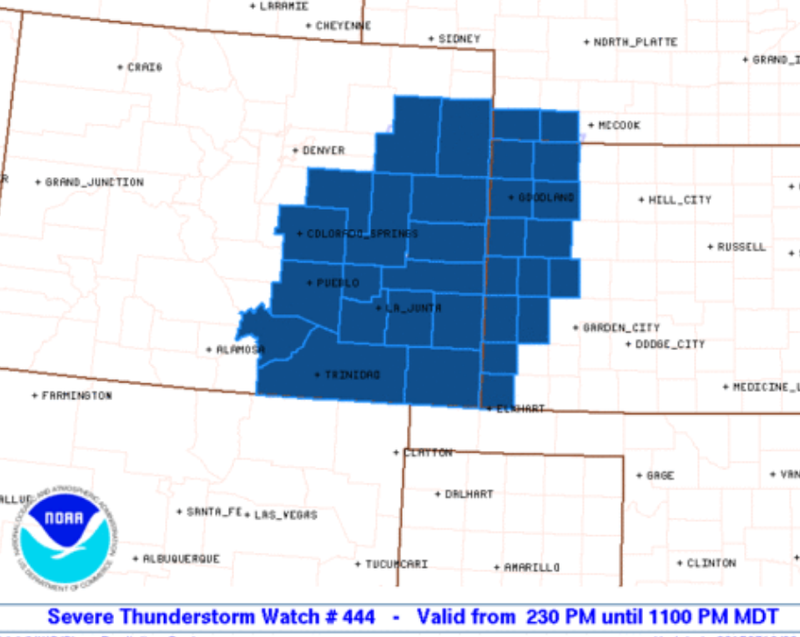 A Thunderstorm WATCH has been issued until 11pm, including #UCCS…Large hail and damaging winds possible are possible with storms which do form. Stay alert to changing weather conditions, and have a plan to seek shelter should a warning be issued for your area. This entry was posted in Uncategorized on July 19, 2015 by tstoeckl. Flash Flood Watch issued 10a-9p today, includes #UCCS. Have a plan in place if you will be in or near areas prone to flooding and flash flooding, and have a way to receive alerts. Be prepared to take action should a warning be issued for your area. Check www.weather.gov/pub for the latest forecast details. This entry was posted in Uncategorized on July 8, 2015 by tstoeckl.